My Audio Cutter is software that lets users cut audio files into pieces. The software\'s interface is friendly and intuitive. It allows you to define in visual or manual mode the start and end time or length to perform the cut. 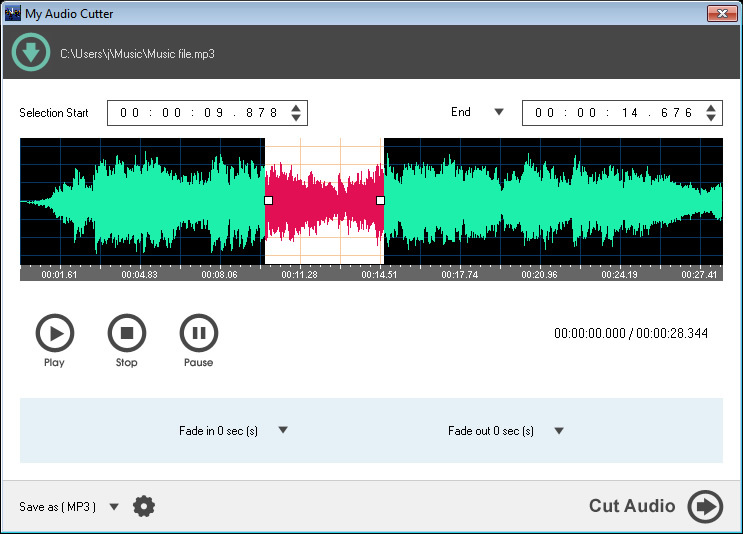 My Audio Cutter is software that lets users cut audio files into pieces. The software\'s interface is friendly and intuitive. It allows you to define in visual or manual mode the start and end time or length to perform the cut. You can play preview the selected segment for better cutting accuracy. It can also add fade-in / fade-out effects to the output audio file. These effects will make the output audio file sound smooth. This is a random MIDI drumbeat generator. It generates patterns up to 4 measures long in any of six time signatures and at virtually any BPM. It allows the user to mutate or regenerate any/ all of the drum sounds in a pattern and plays .wav samples. Create slide shows from your digital pictures with 47 transition effects, navigator buttons and thumbnails styles and publish slide shows as Flash Movie (.swf), Executable File (.exe), HTML File (.htm), AutoRun CD/DVD Files. Aimone DVD Creator is a DVD creator plus a DVD burner. It can convert your favorite movie, video files into a DVD. Supports AVI, MPEG, DivX, DV, VOB, FLV, WMV, 3GP, MP4 and Mov, etc. It is handy, fast and easy to use. Supports DVD menu design. This program uses its artificial intelligence to guess chords for you. All you have to do is to load a media file (wav or mp3) and click a button. Chord Pickout will transcribe the music and write down the recognized chords automatically.